Here it is, only Day 7 of the challenge and I have learned more than any of the other challenges put together. Of course, with each challenge I am in a different place so it would make sense that I would learn different lessons. I think the biggest lesson I have learned this week is this: Much to my chagrin, I have come to realize that I currently do not have my life set up to paint everyday or even as often as I would like or need to. I will say right here, this needs to change because I understand the value and necessity as an artist to having ones life set up to revolve around the creation of art. This seems like such a simple and obvious thing, but it isn't really. Like so many people, I have a busy life. On taking a good hard look at where the time goes, I have come to the realization that I really need a system to manage my time more efficiently, or a ritual. I have to admit, I don't seem to be able to keep to a highly structured ritual. Life seems to throw in extra goodies such as the peaches at the Farmer's Market on Friday. How do peaches disrupt a schedule? Well, peaches are tricky to come by here on the coast. At this Friday's market, someone brought flats of organic peaches from their farm. We bought two flats, which meant I had to can and freeze them before they go bad. This all came to an unscheduled task tacked onto a long day, leaving me exhausted today after working at the store all day. I can hardly see straight, let alone think straight enough to paint at the moment. This also explains my not-so-polished off the cuff blog posts too by the way! I could go on to list all the wonderful and not so wonderful things I get to do in this life but I think I made my point. Change is needed. Yesterday morning I had a wonderful two hour online seminar which dealt with what it takes to create a successful art career. I know, there are a lot of these but this one was given by someone with the experience and track record to back it up. The seminar also brought home to me some of the issues and obstacles I have been discovering during this challenge and gave me a good roadmap to overcome them. Coincidence? Maybe but I think more like synchronicity. I am not going to go over all two hours point by point but will start with just one, time management so I can paint. The challenge continues of course but will shift. I started out with painting everyday as my goal. That is still my goal but in a broader sense. My challenge has been refined to creating a lifestyle that puts painting, drawing, and artist related activities into a daily practice. I feel that I am putting this so poorly. It reads a bit like a cliche to me but that could be my tired mind and body. I will stop here on this topic and leave one last fun tidbit . I am going on a short artist road trip! 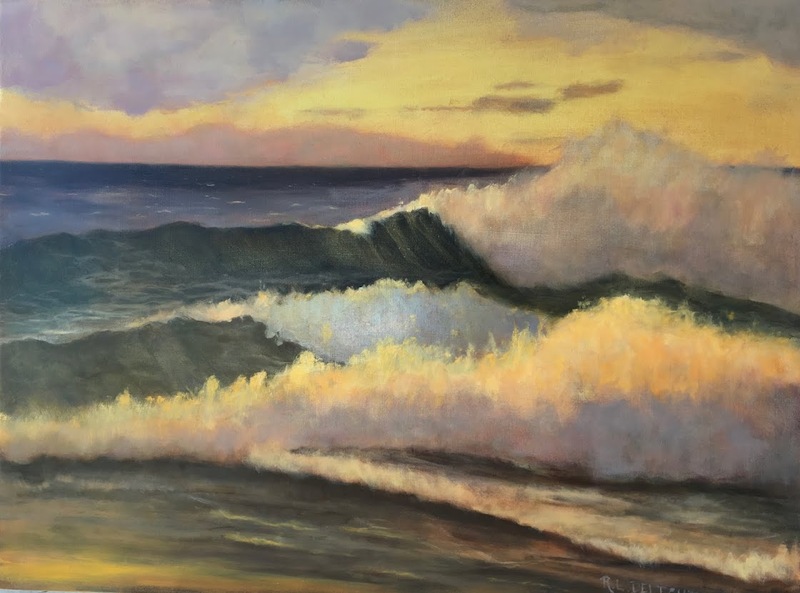 I will be leaving this week for two days to go down the coast to visit the 21st Annual Maritime Art Exhibit at the Coos Art Museum in Coos Bay, Oregon. 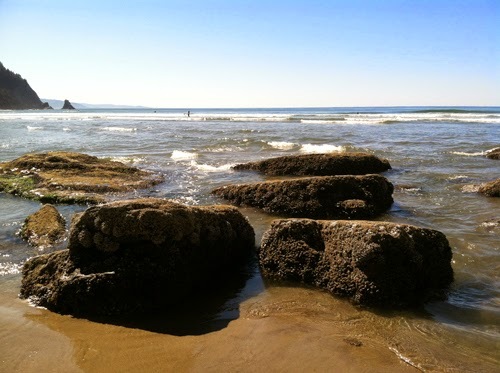 I will be staying at one of my favorite spots on the central Oregon Coast, Yachats (pronounced Yah-Hots). I will be taking my painting pack of course. 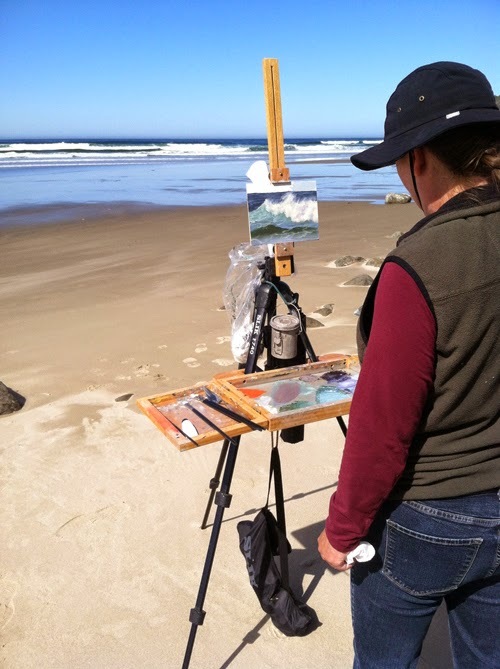 I will also have time to think, plan, and reorganize so I can be on my way to having consistent time at the easel and continue to build skills and a body of work. If you made it this far through a somewhat rambling and personal post, thank you! I promise I will have some fun things, and paintings, to share this week too. Here is a bit of the beauty that inspires me to keep at it. Short Sands of course, as the tide is receding.